Cellana’s core technology is a photosynthetic production system that economically grows proprietary algae strains at a commercial-scale. The patented production system, called ALDUO™ technology, is unique in that it couples closed-culture photobioreactors with open ponds in a two-stage process. 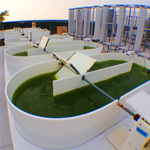 Previous attempts at scaling up algae production have used a photobioreactor or open pond individually, not coupled. 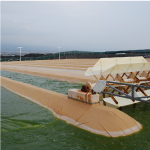 Open pond production, which is needed for rapid algae growth, has historically been hampered by the contamination by undesirable algae strains. Photobioreactors by themselves are unable to produce algae at an acceptable rate and would take up too much room to become commercially viable. 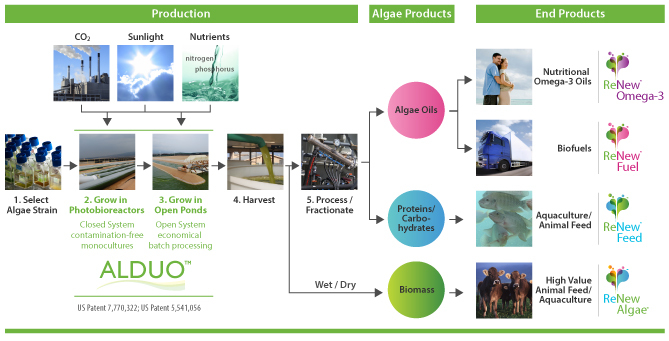 With the development of this hybrid production system, Cellana has achieved significant breakthroughs for the large-scale production of algae-based biofuels and bioproducts. 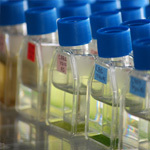 Cellana has access to unique and naturally occurring algae strains from the University of Hawaii, in addition to additional strains collected in Hawaii, that have been selected for high production of algae oil and rapid growth under targeted commercial production conditions. 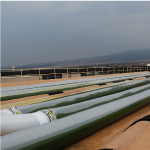 A photobioreactor is used in the first stage of algae production to maintain the constant conditions that favor continuous cell division and prevent contamination of the culture by other organisms. In our demonstration facility, the main body of the production photobioreactor is a long series of large temperature and pH controlled tubes that are connected together in parallel. The algae are exposed to sunlight while kept in suspension to maximize growth. 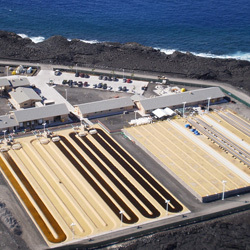 In the second stage, the algae is transferred from the photobioreactors to an open pond system. The open pond is a paddlewheel-driven, recirculating raceway, fitted with a durable plastic liner. The goal is to expose the cells to nutrient deprivation and other environmental stresses that lead to synthesis of products, such as oil for biodiesel. Environmental stressors to stimulate production can be applied rapidly by transferring the culture from the photobioreactor to an open pond. Ponds and photobioreactors are both exposed to full sunlight. In our demonstration facility, on the first day of pond operation, photobioreactor culture is transferred at dawn to a full pond of nutrient-depleted culture medium. Only enough nutrients are transferred with the fresh culture to allow cell division to continue through the morning of the second day. Depending upon the desired product characteristics, the pond is harvested, cleaned and prepared for a new production cycle within a few days after inoculation. The algae cells are concentrated by gravitation into a slurry,excess water is removed, and then the mixture is further concentrated. The wet biomass is then dried. Dried whole algae biomass can then be used as a supplement for aquaculture feed or other animal feeds, or one or more components of the whole algae biomass can be extracted to facilitate multiple product offerings. 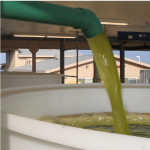 The algae oils, or other co-products, can be extracted by a variety of proprietary and non-proprietary processes, depending on the products desired. For any outdoor microalgae cultivation operation, both experimentation and large-scale cultivation are essential for the successful production of biomass, oil, feed-protein and other valuable co-products. In order to economically maximize yield at a large scale, the capacity to experiment at smaller volumes is essential. 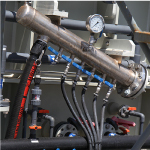 Cellana’s patented ALDUO™ mid-scale technology simulates large scale production (up to 750,000L), but with greater experimental flexibility at significantly lower cost. A variety of strains may be grown simultaneously using a triplicate, randomized-design methodology under outdoor conditions. 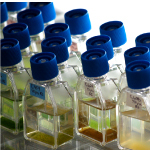 This allows Cellana staff to screen multiple strains for targeted performance characteristics, and to undertake a preliminary techno-economic analysis prior to scale-up. The productivity per given area of photosynthetic microbes such as algae is over ten times greater than that of terrestrial plants. They grow up to 100 times faster than any plant on land. And the biodiversity of photosynthetic microbes is enormous—estimated at more than 100,000 species—and yet most of it remains biochemically and metabolically unexplored. To date, less than 10 species of photosynthetic microbes have been cultivated at industrial scale. Contact us for more information on how Cellana’s technology can help your company.